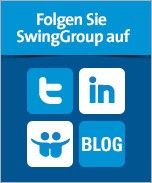 On 29 May 2008 SwingGroup announced the birth of its newest incentive solution: the SwingCard. The SwingCard is the first prepaid B2B gift card in Belgium and it offers donors and recipients various advantages. The most important advantage for the recipient is clear: he/she can use the SwingCard like a credit card and use it to pay in the worldwide MasterCard network. In other words, they can buy what they want, where they want to – even abroad. The baseline for the new product is “Ultimate freedom” - and for good reason! That brings us to the advantages for the company that gives away this pre-paid card. Due to the nearly unlimited uses, the recipient (employee, customer, dealer, etc.) is naturally maximally motivated to perform even better. After all, that’s what incentives are all about. But there is more. By giving a personalised or standard SwingCard, the company remains in the wallet of the employee, customer or dealer for a long time - and in their thoughts too. SwingGroup developed the SwingCard together with KBC and MasterCard. The single load SwingCard will be launched in June. It has a one-off fixed value of €35, €75 or €125. The reloadable SwingCard will be launched in November. It can be reloaded by the cardholder or the donor limitlessly, for example as part of a bonus plan. The reloadable SwingCard is secured with a chip and a pin code. More explanation can be found in the SwingCard launch press release.